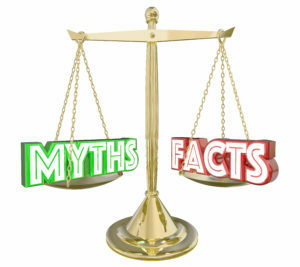 There are plenty of legal myths that have made their way into the popular consciousness, but few have had the staying power of the myth that spouses are legally responsible for each other’s debts. As a matter of logic or chivalry, this myth does have a certain appeal, but the fact remains that in every one of the United States, spouses are not liable for each others’ debts, even in community property states. How did this legal myth ever get started, if it’s only a myth? First, in community property states (Minnesota is not one of these), the “community” is liable for the debts of either spouse. While this does mean that in a community property state, joint marital property can be attached by a creditor of either spouse, that is a far cry from imposing actual personal liability on one spouse for the debts of the other spouse, and separately owned property remains free of claims of the other spouse’s creditors. Second, the old common law doctrine of “necessaries” makes each spouse liable for debts incurred by the other spouse for necessary expenses. These probably include basic medical care, some utilities, or other debts incurred for the purpose of meeting either spouse’s basic life necessities. These elements can be difficult to prove, and the common law doctrine of necessaries is rarely invoked by courts today. This means that in most situations, spouses are only responsible for the debts of the other spouse if an independent reason exists for such liability. For example, you are responsible for your spouse’s credit card account only if you both signed the accountholder agreement, and you are responsible for your spouse’s mortgage debt only if you signed the mortgage note along with your spouse. In short, you must have signed the agreement or contract in question to be held liable for the debt, whether the debt is your spouse’s debt, your boyfriend’s debt, your bother’s debt or your next door neighbor’s debt. To put it another way, the creditor must be able to produce your signature on the contract, whether it’s your spouse’s debt or your debt or anyone else’s debt you can think of, in order for you to be held liable for the debt. Why is this important? In a divorce, it is common for the family court to apportion debts between the parties, for the purpose of holding each spouse harmless for some or even all the debts of the other. It’s good to be aware of exactly for which debts that a creditor could have recourse against the other spouse. For example, if the wife is not signed onto the husband’s credit card account, she is not going to be harmed by his failure to pay the debt, even if the divorce decree ordes him to pay it. And if the husband later files bankruptcy and discharges the credit card debt, the wife will not be harmed by that either, because the creditor cannot claim she has to pay the debt, simply by reason of her prior marriage to him. Knowing that spouses are not liable for each other’s debts should be a fundamental part of everyone’s basic legal knowledge and planning, and anyone who is married or considering marriage should be aware of this important rule.